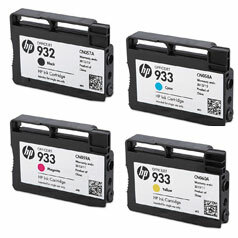 When refilling and using HP 932, 932XL, 933, 933XL or HP 950, 950XL, 951 & 951XL ink cartridges (tanks) in your inkjet printer, it is suggested to follow these general guidelines to help maximize print quality output and maintain a healthy printer. 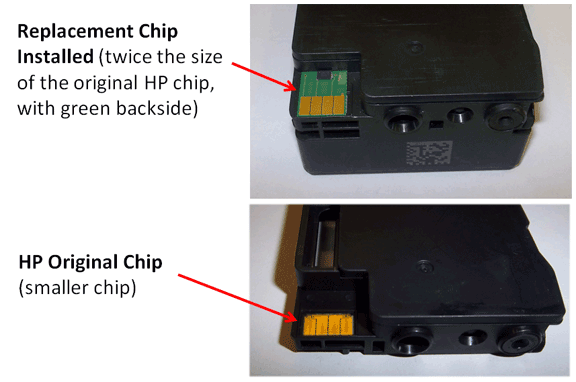 NOTE: Depending on your ink refiller, a replacement chip may or may not have been installed with the refilled cartridge(s). Refer to picture below to help determine which type of cartridge you have, then refer to the applicable section from the HP 932/933/950/951 menus above to address any current cartridge errors or printer issues. 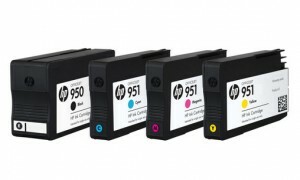 NOTE: HP 932, HP 933, HP 932XL, HP 933XL, HP 950, HP 951, HP 950XL and HP 951XL refilled ink cartridges now have a replacement chip included with the ink refill so cartridge will function nearly identical to HP original ink cartridges. You just need to bypass an initial message which states “non-genuine ink cartridge installed”, or similar, then you can print normally thereafter. Ink compatibility and color gamut (color range) is equally excellent.